Rehabilitation, physical therapy, strength training and increasing balance are not the only uses for stability balls. In different countries throughout Europe, exercise balls have been used in schools as ball chairs. Many benefits have been reported to using exercise balls as ball chairs, including improved focus, better organization and improved posture. An exercise ball is a useful workout tool that helps to increase balance and strengthen the core muscles in your back and stomach. These muscles support your spine and help to take the burden of weight off the spine. Strong core muscles are elementary in achieving good posture. Recently, the exercise ball has moved out of the gym and into the home and office. People are using the ball as a chair in order to strengthen core muscles. This is called “active sitting” because your muscles are engaged. Using the wrong techniques with an exercise ball may do you more harm than good. This article will tell you how to use an exercise ball as a chair. If you are of average weight and you are under 5’3″ (160 cm), you should choose a 55 cm (21.7 inch) diameter exercise ball. 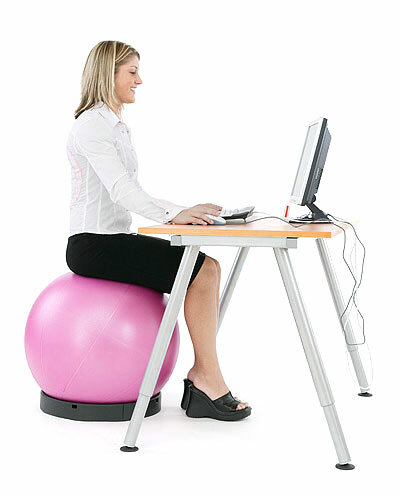 If you are between 5’3″ and 6′ (160 and 182.9 cm) you should choose a 65 cm (25.6 inch) diameter exercise ball. If you are over 6 feet (182.9 cm) tall, you should probably use a 75 cm (29.5 inch) diameter exercise ball.